This page is for short sharp modelling tips. Contributors: the [experimental] 'house style' rules are one post per tip; one Medium photo per post (max 800 pixels wide) and just a one or two paragraphs of text (more than that then it's not 'brief' and would best be in the Workshop). Consider using the 'two Column' Layout when posting. Planting small Dioramas on the line can be a difficult procedure but I, as a keen Bonsai creator and grower, have devised this method. 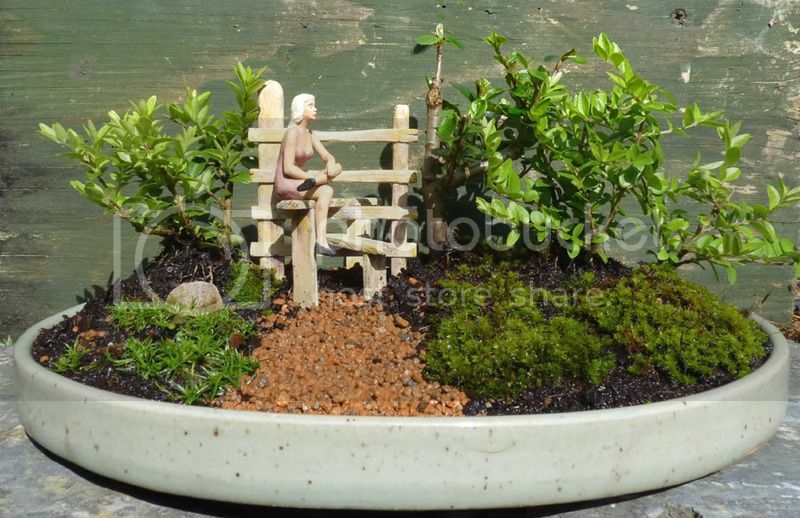 By planting the diorama in a small container first ( here I have used a bonsai container but a seed-tray would do just as well ) you have full control of the planting which can be left for a few months to mature. When mature, all roots will have knitted together to form one large mat and then the diorama can be lifted out in one piece and planted on the line where needed. It works especially well for those difficult to reach places. This one was created using a home made stile and a few small Cotoneaster and Lonicera plants, struck simply from cuttings, a bit of moss. Simple pruning will keep it all in scale in future. Looking to add a bit of interest to the interior of the Station building (a Brandbright kit) I've used a discarded non-working wristwatch as a clock. Extra tip - if you use more than one, set the time consistently first!